Absolutely wonderful tank top. It's airy but it does have its downsides in how it is made fully out of cotton. Otherwise, I love this tank top. 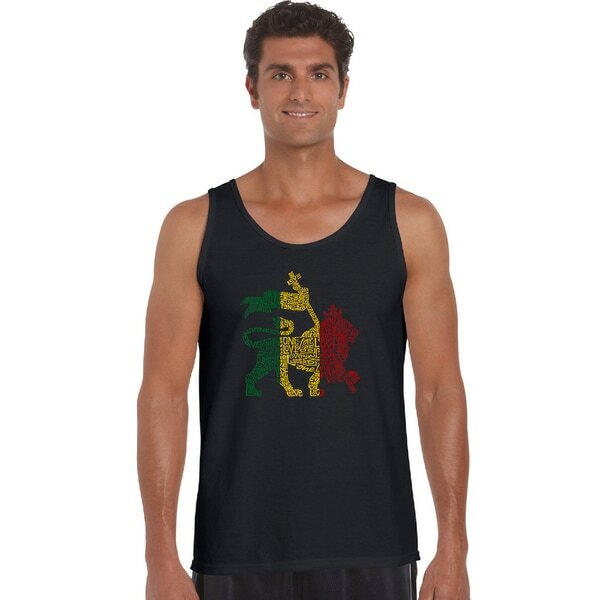 Show the world you believe in the concept of unity with this men's cotton shirt that uses the words 'One Love' to form the Lion of Judah associated with Rastafarian culture in the colors of the Jamaica flag. Wear this comfortable tank top for sports, working out or just enjoying a warm, peaceful day. Nice materials and picture, but fit and shape ran a little wide.